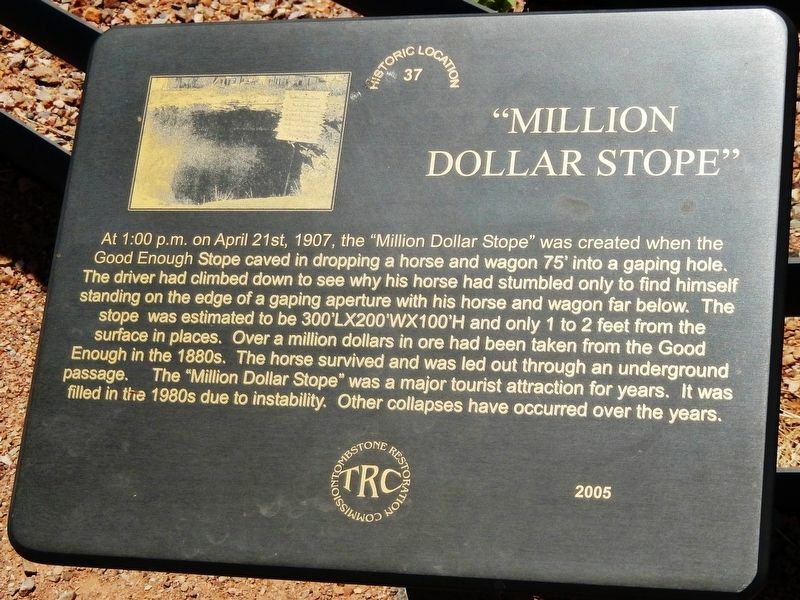 At 1:00 p.m. on April 21st, 1907, the "Million Dollar Stope" was created when the Good Enough Stope caved in dropping a horse and wagon 75' into a gaping hole. 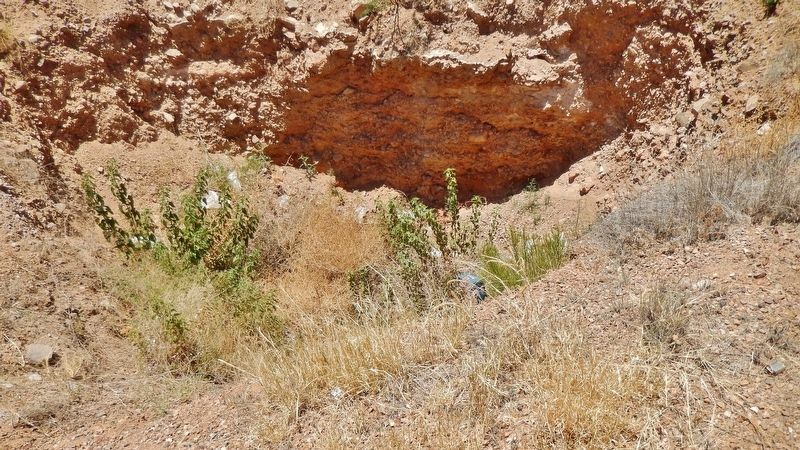 The driver had climbed down to see why his horse had stumbled only to find himself standing on the edge of a gaping aperture with his horse and wagon far below. The stope was estimated to be 300’ L X 200’ W X 100' H and only 1 to 2 feet from the surface in places. Over a million dollars in ore had been taken from the Good Enough in the 1880s. The horse survived and was led out through an underground passage. The "Million Dollar Stope” was a major tourist attraction for years. It was filled in the 1980s due to instability. Other collapses have occurred over the years. 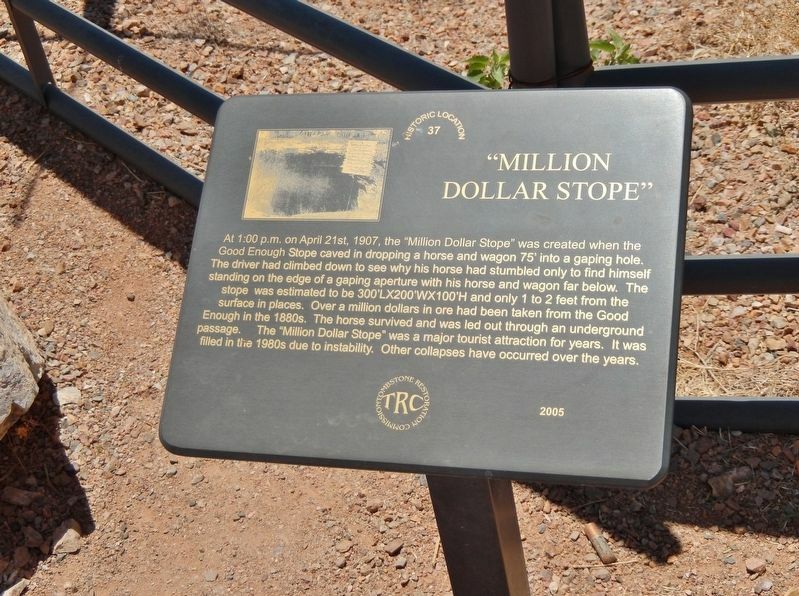 on the south side of the street, next to a metal fence surrounding the "Million Dollar Stope". Marker is at or near this postal address: 435 East Toughnut Street, Tombstone AZ 85638, United States of America. Touch for directions. Other nearby markers. At least 8 other markers are within walking distance of this marker. The Mines of Tombstone (a few steps from this marker); Tombstone Engine Co. No. 1 (within shouting distance of this marker); City Marshall Virgil Earp (about 300 feet away, measured in a direct line); Owl Cafe and Tourist Hotel (about 300 feet away); The Oriental Saloon (about 400 feet away); Curly Bill Brocius (about 400 feet away); Bird Cage Theatre (about 400 feet away); The Grand Hotel (about 400 feet away). Touch for a list and map of all markers in Tombstone. More. Search the internet for Million Dollar Stope. Credits. This page was last revised on March 15, 2019. This page originally submitted on March 15, 2019, by Cosmos Mariner of Cape Canaveral, Florida. This page has been viewed 43 times since then. Photos: 1, 2, 3. submitted on March 15, 2019, by Cosmos Mariner of Cape Canaveral, Florida.